There are various materials from which gutters can be constructed, including steel, vinyl, and copper. Among our customers, however, aluminum is the most popular choice. Aluminum gutters have been in wide use for nearly thirty years. Aluminum isn’t necessarily as tough as stainless steel but, unless you live in an area with high winds or flying branches, its advantages often make it the best option for someone looking for solid performance within a reasonable budget. Aluminum gutters are relatively inexpensive, and they offer a key advantage in that they will never rust. Aluminum gutters with a baked-on finish will wear better than steel gutters — they can easily last more than twenty years in any climate. They are also available in a variety of popular colors, can be painted to match more specific colors and can be quite easily shaped. They can also be accessorized with decorative cast brackets similar to copper gutter systems. Aluminum gutters are seamless, custom-fashioned on-site, and offer a surprising amount of strength despite their light weight. When purchasing aluminum gutters, we recommend gutters at least .032 inches in thickness, made of primary aluminum. Thinner gutters won’t last as long, and secondary aluminum is made from recycled material that is often inconsistent in its thickness. Aluminum gutters are available in five or six-inch sizes. Five-inch gutters are the most common, however a six-inch gutter can accommodate more water before it overflows. 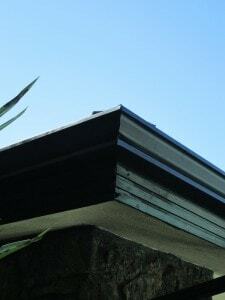 A six-inch gutter, however, needs to have the gutter board properly sized to accommodate it. While aluminum will not rust, it is possible to corrode. Aluminum should not be put in direct contact with another metal to avoid electrolysis. Also, chemicals found in some concrete, treated lumber, brick mortar, and stucco can lead to corrosion. As such, aluminum gutters are generally surface coated or chemically treated to increase their lifespan. If you have any questions regarding aluminum rain gutters, or if you are not sure if they are right for you, please contact us at Rain Gutter Pros. Our knowledgeable staff has years of experience and are happy to help you find the perfect solution for your home.